Part 1 General issues: Markets for fried food: The UK, other European countries; Regulation in the European Union, in the United States; Health issues. Part 2 Frying oils: Composition of frying oils; Factors affecting the quality of frying oils and fats; Measurement of frying oil quality and authenticity. Part 3 Improving product quality: Manufacture of pre-fried potato products; Managing potato crisp processing; Effective process control; Flavour and odour development in frying and fried food; Improving texture and colour in fried products. Frying is one of the oldest and most widely-used of food processes. Its popularity relates to the speed with which a food is cooked, the distinctive flavour and texture frying gives the food and its contribution to increased shelf-life. As a result the process is used for a wide range of vegetable, meat and fish products, particularly ready meals and snack foods. 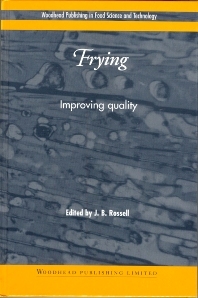 Edited by a leading authority in the field and with a distinguished international team of contributors, Frying provides an authoritative review of key issues in improving quality in the manufacture of fried products. Part one of the book sets the scene by looking at the differing types of fried products and their markets as well as at the regulatory context. It also includes an important discussion of the role of dietary lipids, the impact of frying on lipid intake and its influence on consumer health. Part two looks in detail at frying oils, their composition, the factors affecting frying oil quality and ways of measuring frying oil quality and authenticity. Part three looks at quality issues relating to fried products. There are chapters on two of the main types of fried product: pre-fried potato products such as French fries and the manufacture of potato crisps. Three final chapters look at effective process control of frying operations, flavour development in frying and fried foods and ways of analysing and improving the texture and colour of fried products. Frying oils are the most important common influence on fried product quality. They not only need to withstand the stresses of high temperature in frying but also maintain their quality during subsequent product storage. Frying: improving quality is a standard reference for the food industry and all those concerned with the quality of fried products. Dr Barry Rossell has an international reputation in frying. Formerly with the Leatherhead Food Research Association, he has been Chair of both the BSI and SCI Oils and Fats Committees in the UK, a member of both the International Standards Organisation and Codex Alimentarius Fats and Oils Committees and a member of an EU team assessing the authenticity of frying and other edible oils.